Now we had a premise. The heroes had agreed to test the effectiveness and security of a training facility run by Ziggy Frood, a wizard not entirely uninspired by some of the hippie surfer bums from Hawaii Five-O (which I'd been watching on Netflix at the time). The agreement was that the party would be healed and resurrected should any calamity befall them, and their short-term memories would be wiped so as not to allow any biases or preconceived notions about how to approach the challenges. Unbeknownst to the party and the wizard, the gnomes who had been funding the whole endeavor had decided to pull the plug on Ziggy's funding--in other words, no more resurrections. What was supposed to be an ultimately harmless (albeit eccentric) exercise between good guys had turned the wizard into a bad guy, without him realizing it. Actually, I'm getting a little ahead of myself. By the time I had finished drawing the empty, circular room that was the ground floor, only part of the premise was fleshed out. I knew the tower was going to be some sort of school, but I still couldn't decide whether it should be a wizarding school, or a janitorial school, or what. So, I bought some time for myself by using the second floor of the tower as the dormitory level. Surely by the time I was done drawing the beds and the bathroom and the dining hall, I'd have figured things out. As a side note, a characteristic anachronism of my generally low-tech campaign settings is that they all have bathrooms with running water and flush toilets. I don't know why that is. It's just the way it's always been. I always struggle when it comes to designing bedrooms, kitchens, and other areas that are more often assumed to exist in an RPG than actually shown. Unless there's a particular reason for a party to visit them (beyond thorough exploration), it's tough for me to do anything other than jam them in out of a sense of obligation to some sort of realism. Thus, there were many bland rooms with little other than basic furniture in place. If the students were supposed to be on break or not even at the tower yet, the second floor would seem especially barren. It wouldn't make much sense for there to be random monster encounters, and no particularly good skill challenges or puzzles seemed appropriate. Once more, Dungeonscape to the rescue: instead of having a dungeon with designated locations for each encounter and event, why not have a dynamic dungeon with a life of its own, that the heroes happen to be interrupting? What if the caretaker--say...a minotaur--was patrolling the floor? And what if there was a shopkeeper--the owner of the "school store," as it were--who might interact with the caretaker should they ever cross paths? I could always spice up the rooms with some vivid descriptions of how boring they are--the real focus of this floor would be its inhabitants. I wanted a monster for a shopkeeper. 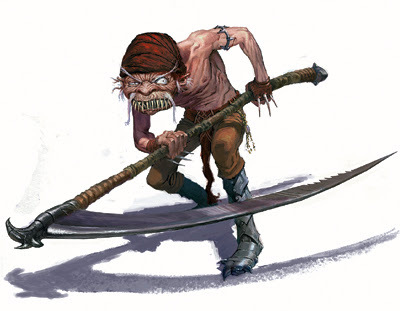 Poking around my various Monster Manuals for something exotic, and of an appropriate challenge rating should fighting break out, I selected one of the more unlikely options for a shopkeeper: a redcap. Brutal and nearly insane, redcaps are the kind of monster that would sooner slice you open and soak its fashionable hat in your blood than quibble over exact change. However, there are always exceptions, and there's usually at least one way to twist a monster's normal behavior to conform to whatever unusual role you might have for it. Redcaps, for example, are very superstitious. They also have been known to hole up in abandoned locations such as old towers. Suppose one outcast redcap gets separated from the pack, finds an empty tower, decides to make himself at home, and then encounters a persuasive wizard who does a little bit of sweet-talking and bargaining to get the redcap to stay on as a shopkeeper...setting some very clear boundaries by persuading the redcap it's "bad luck" to do one thing and not do another thing. It's bad luck to eat the customers, for instance. See? Perfectly logical redcap shopkeep. As for the minotaur caretaker, he could simply be a hired hand who has grown too old and wise to lust for battle the way his more reckless kin do. Moreover--and this would work nicely once I'd established the tower as a battle academy, too--he'd still be capable of scaring off any hoodlums and would-be invaders. Not too capable, mind you; the heroes still had to be able to take him down if push came to shove. 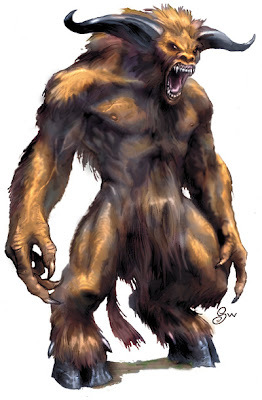 A half-blind minotaur (so, 50% miss chance), with no weapons other than his natural attack (gore 2d6+STR, if I recall correctly, with a lower strength score due to his advanced age) would be appropriate against a party of three low-level characters, I thought. To add to the fun, the key to unlock the door to the next level would be dangling from a ring placed atop one of the minotaur's horns. Victory in combat, sleight-of-hand, or a clever ploy to otherwise separate the key ring from the minotaur would be the order of the day, and the otherwise dull rooms on the second floor could provide interesting opportunities for the party: scoop up the key ring from atop one of the bunk beds, or knock over the stew pot in the kitchen and grab it while he's leaning over to clean up the mess, perhaps. Between the monster merchant and the roaming caretaker, there was finally enough for the party to do on this floor. Next up was the final floor of the tower before the roof, but the roof would only serve a brief story purpose--the real action, and the final showdown, would be just ahead.